This T-shirt from 1979 came from one of the dances put on by Gay Services of Kansas, at the University of Kansas. Another hot Sunday is already upon us, and later on, when the driveway gets a bit shaded, I’ll tend to one of the planned weekend chores–washing the car. 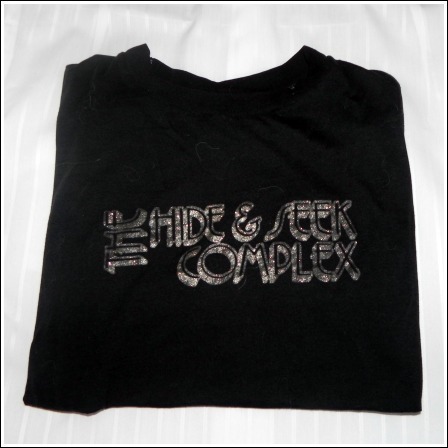 T-shirt from The Hide & Seek Complex in Colorado Springs, Colorado--a souvenir from New Year's Eve 1979.
years for sentimental reasons in the bottom of a chest of drawers. But like many items whose value changes when a person is making a move, these once nostalgia-filled keepsakes were turned into rags. The funny thing is that afternoon, I did wash the car with them, even the grimy wheels. 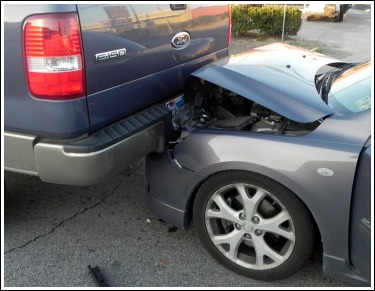 But as I finished my task, and the car was looking all slick again, I decided that these shirts still meant something to me; I wasn’t ready to toss them all wet into the trash dumpster. One of them–a bright red one–is a souvenir from a trip in 2000 to Chile. It’s from the Capel Pisco Distillery in the Elquí Valley. You haven’t lived if you’ve never had a Pisco Sour! The other two–one black, the other, now a dingy white–are much older. Unfortunately, the sleeves are cut off and long slits run down the sides, which was part of the look in the early 80s to go with the two pairs of parachute pants that I had. With a red pair and a black pair teamed up with the slitted shirts, I had four different options to choose from to go out clubbing! Actually, I had gotten the T-shirts when I still lived in Kansas, so it was probably about three years before I dismembered the sleeves here in Houston. I got both of the shirts when I was a grad student at Kansas State University in Manhattan, Kansas. (Read more about that here.) One of them is from one of the dances that the KU gay group used to have in the Student Union. A bunch of us from K-State would pack ourselves into cars and make the 90-minute drive (more if there were pit stops) from Manhattan to Lawrence. Though there was a lot of KU-K-State rivalry on the football field and basketball court, the boys and girls didn’t have any time for that on the dance floor! 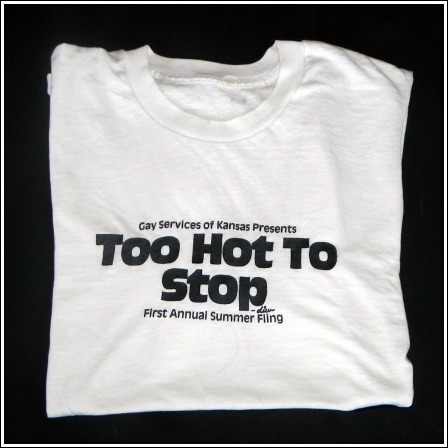 This shirt came from the 1st Annual Summer Fling, put on by the KU group, Gay Services of Kansas, in 1979. The KU-Lawrence LGBT community has done a good job of chronicling its history, part of which can be found here, where I verified that my shirt was from 1979. Actually, I had a much better situation for coming out, surrounded by college friends, who were basically doing the same thing. 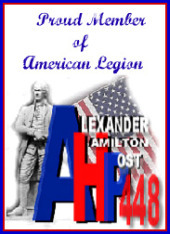 We could, for the most part, enjoy the process with a lot of support from each other, not a situation I could have had in the military. I guess that’s why I can’t use these T-shirts for car washing; the significance that they have is just too much. And rather than shove them back in a drawer, I have a room with a lot of my keepsakes on the walls. Put in frames, they’d go perfect there.